The marriage of Chef Todd Gray and Ellen Kassoff initiated Todd into the world of Jewish cooking. In 1999, Todd combined his love for farm-to-table ingredients with his passion for Jewish cuisine by opening the acclaimed Equinox Restaurant in Washington, D.C.
Watch as Todd & Ellen walk us through one of their favorite recipes. Then, sample the finished product! 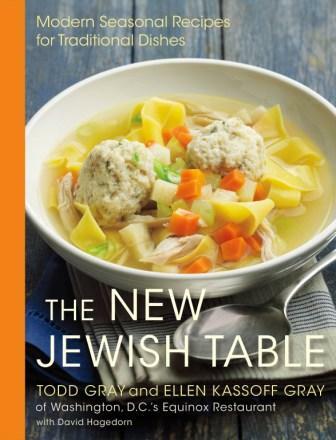 The New Jewish Table by Chef Todd Gray and Ellen Kassoff Gray explores the melding of two different cooking cultures, seasonal American and Eastern-European Jewish. Todd and Ellen talk about the food they grew up with, their life together, and how rewarding the sharing of traditions— and meals—can be. Todd Gray is a five-time James Beard Award nominee. He graduated with honors from the Culinary Institute of America and has cooked with some of the nation’s top chefs. Both he and Ellen co-own and operate Equinox Restaurant, Muse at the Corcoran Gallery of Art and Hamill Gray Catering. Todd is also the culinary director for Salamander Hotels and Resorts and the Ronald Reagan Building and International Trade Center. Ellen Kassoff Gray is an award-winning General Manager for all their operations. She is a member of Les Dames d’Escoffier and has received the Women Chefs and Restaurateurs Golden Fork Award for Front-of-the-House Excellence. There is nothing that brings a bigger smile to my face than a gurgling baby. So when Sarah and her beautiful daughter came into my house last Monday, I was delighted to see them both. In a nanosecond, we were settled around my kitchen table, and the baby was cooing away and batting her precious little hand at the toy suspended from her carrying basket. What a wonderful way to start the week! Sarah and I were meeting to see how we could do some programming together. She is now the DCJCC’s Director of Family Enrichment and Community Outreach, and she was very interested in providing more services to the interfaith families that use our JCC. I was thrilled to hear of her interest. After reviewing many ideas and options, we settled on doing a “hands-on” project for families that included both the parents and the children, had a learning component, and also a “take home” for both the parents as well as the children. I love these kinds of projects, where the activity will be appealing to families that already use the DCJCC AND also to new families who have not yet stepped into the building. With that in mind, we brainstormed about all the social media available to us including the DC parent list-servs, blogs, Google ads, our own DCJCC website, my website and many other web locations that might get to our target audience of interfaith families. Here’s to more great collaborations and programs that reflect the beautiful diversity of our Jewish community! Come and learn how to create a fun Passover experience for your family! Parents will leave this experience with new ideas to implement and a complete book of tried and true recipes. Children will take home special hand make objects to use during the Seder. We welcome all families with young children, especially interfaith families. One reason I love my emails of headlines from the Times of Israel is that every once in a while there’s something so ridiculously cool I don’t quite know what to do with myself. Of course, I generally feel like I’m the only one who thinks it’s so cool, but I try not to let that small factor affect my overall enjoyment learning about something new. One of my favorite topics to read about is what can be dubbed “Jews from Unexpected Places,” i.e. not places we often associate with Jewish communities, such as the US, Israel, or Europe, which appears every so often at the bottom of the headlines. Today I was clicking my way through the ToI website and found an article about the Jewish community of Jamaica. I consider myself fairly knowledgeable about Jewish history, including the Jewish migrations to the Western Hemisphere, but I had no clue there was ever a Jewish community in Jamaica, let alone one that is active today in Congregation Kahal Kadosh Shaare Shalom, the island’s only remaining synagogue. Given the long history of Judaism and roles Jews have played as merchants over the centuries, Jewish communities in other places shouldn’t be, well, surprising. So much of American-Jewish culture (which often means Ashkenazic culture) is focused on Europe and Israel that I think we often forget how much of a global reach Judaism has had. Most of the Jewish-American traditions I know best come from Eastern Europe and New York; and like a lot of American Jews, those are my personal family traditions. But our knowledge of Judaism should be wider. Last year while in Israel I met a Jew from Kenya, a place I had no idea has a Jewish community at all, let alone a strong one. I read an article in September about the Jewish community of Uruguay. A few months ago I had dinner with a woman who works with the American Jewish Joint Distribution Committee and with a Jewish Community Center in India. A Jewish man from Uganda is studying at the Conservative Yeshiva in Jerusalem this year, and every time I go to the Israel Museum I find at least one object I never would have dreamed of, especially in the Costumes and Jewelry exhibit. And the Washington Jewish Film Festival will be screening a documentary about the Jews of Nigeria. These places have their own traditions, histories, and, of course, food, all made unique by the combination of Judaism and other local customs. 1) that Jews are found in cultures all over the world, and speak be’chol lashon – in every tongue! 2) that Jews come in every color! 3) not to ask Jews of color if they have converted, or other exclusionary questions. Though Jews have been living on Jamaica since 1577, maybe even since Columbus’ first trip in 1492, the community is getting smaller; it’s down to about 200 people. But it is a strong, diverse group of Jews by birth and Jews by choice, many of whom have converted back to their family’s Jewish roots. They are maintaining what is possibly the oldest Jewish community in the Western Hemisphere, and a wonderful reminder of the beauty that is the multi-faceted Jewish culture. Filed under: Jewish Living, Uncategorized | Tagged: Jamaica, Jewish, Jews Around the World |	Comments Off on Where Is A Jew? Along with the songs we remember from childhood and enjoy hearing in the sweet little voices of children everywhere, we also remember what we eat during every Jewish holiday. Chanukah known to us as the festival of lights, is a joyous holiday that celebrates an ancient victory for freedom and peace. It is still marked by the lighting of candles on the menorah, traditional fried foods, singing and a (hopefully) “lighthearted” exchange of gifts. In my family of origin, my mother always had a few extra little gifts wrapped (all of our gifts were little, just a token of giving) in case and in hopes that we would bring a friend or two home for dinner and candle lighting. Gifts were socks for the winter (prettier ones than we would normally buy), knit gloves or a scarf (in other words, things we were going to need), and, for extra pleasure, a book. I remember opening the next volume of a Trixie Belden mystery book and could hardly wait to get into my bed and read. Chanukah was a family time, fun because all the cousins got together, each aunt handed us a $5 bill, and we sang and played dreidel, knowing that the Sunday during Chanukah was our gathering. My Sephardic grandmother never heard of latkas and always said the Yiddish food is not authentic. We were treated to BIMUELOS, a fritter fried and sweetened. Latkes were eaten in the privacy of our home, so nona didn’t know that we had a taste for the Eshkanazi. She was proud of her culture and history, and made that clear every time we were with her. Makes about four dozen. Everyone will eat 2-3, except those on diets or gluten free. It is a different world from my nona’s. Enjoy as you read a lovely Chanukah story with friends or family. Stop at the DCJCC gift shop to buy a book you will all enjoy and have for years to come! Chanukah brings light into our home as the menorah glows, brighter each night. It is my sincere hope that these lights will bring lightness to your lives and to the world we live in, sometimes seeming so very dark. And may Israel celebrate with the light of peace and hope. It might seem crazy, but the daily struggle we have today over the balance between tradition and modernity and identity is not new to the Jewish people. Torah is full of examples of Israelites trying to live in the bigger world while maintaining their ways, not always successfully. Even the story of Chanukkah, which starts on December 8 this year, is about how one group of people thought Jews should balance tradition and modernity. If it weren’t a struggle, if we didn’t have conflicting feelings about this, it wouldn’t still bother us today, and that is why it is still so important. This afternoon, the DCJCC hosted Anat Hoffman for a lunchtime update on the current state of pluralism in Israel. Hoffman works with two organizations that are working for change, i.e. changing tradition, in Jewish life in Israel. One is the Israel Religious Action Center. The IRAC, as it’s affectionately known, is the legal arm of the Union for Reform Judaism in Israel and addresses issues of religion and state in Israel, including social justice, equality, and religious pluralism. They are trying to find a way to balance traditional and modern values and make religion in Israel something all Jews can feel comfortable with. Women of the Wall meet every rosh chodesh (new month) to pray at the kotel together. From my own experiences with them, the Women of the Wall are not looking to start a fight with local police officers or upset other worshipers; they merely want the right to pray in a way that is meaningful to them. and, of course, the hold a small group of ultra-orthodox extremists have over all religious aspects of the country, including over the management of holy sites. Hoffman’s struggles with the IRAC and Women of the Wall are two windows on the struggles we face between living our traditions and embracing the modern world we live in today. Anat’s visit kicks off a slew of upcoming Israel programming at the DCJCC. Theater J, the DCJCC’s professional theater company, will be staging two plays about life in Israel, and it is one of those that I want to talk about specifically. Apples from the Desert, by Savyon Liebrecht, is a story of a search for balance. The protagonist is Rivka, a young Sephardic religious girl, whose life is turned upside down when she meets and falls in love with a secular kibbutznik from the south, Dooby. Rivka has to do what all of us strive to do: find a way to maintain her religious identity in a way she feels is appropriate without dismissing the expectations of her family and community or turning away from what she really wants. I don’t think there’s a “right” or a “wrong” solution to this problem, but I do think we can all arrive at answers we are comfortable with, at least for the moment. I have no doubt this is a daily struggle, something that as individuals we always have to come to terms with and re-evaluate as our lives move on. And on that note, Happy Thanksgiving from EPDC! Every year, as I prepare my menu to share with family and friends, I think of ways to add meaning to the meal.It is the beginning of our New Year and a time we think about our hopes and desires for the year to come, dreams for ourselves, those we love and the world around us. There are foods we can add to our table that symbolically add good wishes for the new year! Dates dipped in powdered sugar and served along with the more familiar apples and honey, bring sweetness to the new year. Pomegranates are said to contain exactly 613 seeds, the same number of mitzvot, the biblical commandments. These beautiful fruits often decorate the holiday table but cut open and eaten bring a year filled with as many good deeds at the pomegranate seeds. Pumpkin is often served in some form in Sephardic homes to express the hope that, as this vegetable has been protected by a thick covering, we too will be protected. Our family ate the seeds toasted and salted by my nona. Leek is considered a food for luck, something we all need. In Sephardic cooking, leek is as common as the onion and is cooked and added to meat for keftes, small burgers made with boiled leeks chopped, ground beef or turkey, eggs, matzo meal and salt and pepper to taste, then fried lightly in oil, cooked in tomato sauce with lemon or baked in the oven. For a vegetable side dish or for vegetarians, boiled and chopped to mix with chopped spinach, matzo meal, eggs and salt and pepper and cooked like the meat. Beets are a prime vegetable at this time of year. Roasted with a little olive oil (wrapped in foil and baked at 450 for 40 minutes until soft) or boiled, beets are a beautifully colorful addition to the Rosh Hashanah table. They can be served cold in salad or alone with a little balsamic vinegar. Recently a friend told me to be sure and add celery and raisins to the holiday table. This is an easy one, since celery is good in salad and a must in chicken soup, a tradition at the holiday table. For the raisins, add to your favorite apple cake or make these delicious Russian Tea Biscuits, a recipe brought from the “old country” (this time from eastern Europe, an Ashkanazi treat) and filled with raisins and nuts. Why raisins and celery? For a raise in salary! Fill, using what you like from below, all or some. This is for you to enjoy, put your signature on it! Can be frozen if made in advance. As these are very full, we hope for a full and satisfying life. Enjoy as the finish of a wonderful and meaningful Rosh Hashanah meal. Shana tova, and hopes for a year of sweetness and satisfaction to you and your loved ones! *While this post was supposed to go up a few weeks ago, it mysteriously disappeared into the bloggy ether… Enjoy all the festive foods during these Days of Awe! Suze Orman thinks you should be going to a cool Jewish summer camp. We’re days away from the Jewish New Year and it seemed the right time to focus on all things both Jewish and new. New Camp: Four new Jewish summer camps are gearing up to create more memorable overnight camp experiences for underserved populations, thanks to the Foundation for Jewish Camp, in the areas of business and entrepreneurship, health and wellness, sports, and science and technology. New Name: “Jew Pond” in New Hampshire, named as a pejorative in the 1920s when the hotel to which it was connected was bought by two Jewish businessmen from Boston, has been officially renamed Carleton Pond. New Shofar Blowers: DC Congregations, including Adas Israel and Tifereth Israel, are seeing more and more women, plus young and older adults who want to blow the shofar, and are learning for these High Holidays. New Place Without a Minyan: “For the first time in some 2,000 years, Alexandria [Egypt] will not have a minyan,” as Egyptian authorities cancel services at Eliyahu Hanavi Synagogue and deny visas. New Info on Interfaith Families: With interfaith relationships making up a not-insignificant amount of the Jewish community, new survey data helps Jewish organizations engage these families, who are looking for outlandish things like a welcoming attitude, invitations to learn about Judaism, and events for interfaith families. Filed under: Dialogues, Israel, Jewish Living, Kids and Parents, LGBTQ, Shabbat Surfing, Wellness | Tagged: Egyptian Jews, interfaith, Jew Pond, Jewish Camp, New Year, Rosh Hashanah, Shabbat surfing, women blowing the shofar |	Comments Off on Shabbat Surfing: What’s New?